December 2015 – My Story – ISB and beyond !!! 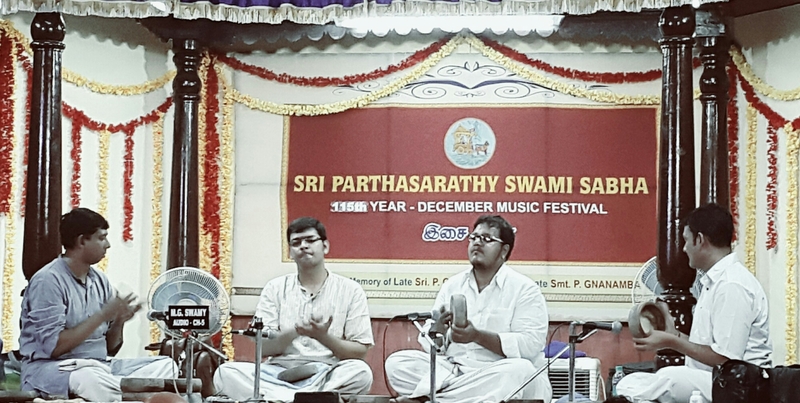 Kanjira quartet magic today at the Parthasarathy Swami Sabha. First B.S. Purushotham and Anirudh Athreya played a 88 count talam (kanDa triputa with the each beat of lagu substituted by tisra, catusra, kanDa, misra and sankIrNa and dhrutam in 2 kalais). They played all 5 nadais. Then Shree Sundarkumar and K.V. Gopalakrishnan played kuraippu and mOrA kOrvai in the same 88 counts but in a tala where they put kanDa aTa with the 4 sashabda kriyA (sounding beats) replaced by tisra, kanDa, misra and sankIrNa. All in all a rhythm ragaLai! * Grahabhedam is the process of shifting the tonic note (AdhAra shruti) to another note in the same raga, thereby arriving at a different raga. The pure positions of the notes are maintained but they assume different colors. It is like a new raga within the old raga. * Grahabhedam is very subjective and an area open to interpretation. What works and seems right to one musician may not do so to another. * Certain anchor notes cannot be compromised. For example, gamakas cannot be used for sa and pa.
* It is not necessary to show the length and breadth of the second raga arrived at. It is enough if we can present a convincing picture of the second raga. * It is not necessary to always think which note becomes the new sa. Many a times it is a phrase in a raga that leads you organically to a phrase in another raga. * It is essential to have perfect control over pitching of notes to attempt successful grahabhedams. In Hindustani music, it is used as a tool for practice to improve ones pitching. * When grahabhedam is done in kalpana swarams, both ragas run as twin tracks. When done in alapana, we slide to the skin of the second raga with the gamakam and aesthetics of that second raga at play but with the awareness of the first raga so that no wrong note is touched. * The grahabhedam shift is highlighted well when there is a change in the structure of the raga itself i.e., not from one sampUrNa to another sampUrNa raga or from one auDava to another auDava raga. She changed ri of simhEndramadhyamam to pa of bauLi. Shifted from sampUrNam to auDava shADava raga. * Ni – Ri shift with reciprocal shift from Ri. She demonstrated this by shifting from amritavarshini ni to karnATaka sudha sAvEri sa and from karnATaka sudha sAvEri ri to amritavarshini sa. * She demonstrated a group of 5 auDava ragas which can be derived from each other through grahabheDam and have a special relationship with each other. These ragas are mOhanam, madhyamAvati, sudha sAvEri, sudha dhanyAsi and hindOLam. For example, mOhanam ri to madhyamAvati sa. * Varjyam of sa and pa or both is a common way of doing grahabhedam and a very safe way as there is no chance of any gamakam needs in these anchor notes. Among sampUrNa ragas, when we remove sa and pa from 6 ragas, we get the above group of 5 auDava ragas. These 6 ragas are tODi, bhavapriyA, pantuvarALi, shubapantuvarALi, kalyANi and gamanAshramA. * Grahabhedam can be done in any aspect of manOdharma singing – alApana, neraval, tAnam or kalpanA swara. She took the example of shubapantuvarALi, did sa/pa varjyam and derived the five ragas listed above. From shubapantuvarALi ri to madhyamAvati (but she sang brindAvana sArangA). This was done in alapana. Then she shifted from shubapantuvarALi ga to hindOLam while singing tAnam. Then she shifted from shubapantuvarALi ma to sudha sAvEri while singing neraval for the line “vAsudEvuni priya sOdarI” from GNB’s composition “nI samAnamevaru” She then shifted from shubapantuvarALi dha to sudha dhanyAsi while singing kalpana swaram. She also demonstrated shift to all the 5 auDava ragas from shubapantuvarALi while singing kalpana swaram. * Musicians have used grahabhedam as the focal point in their compositions. Examples are M. Balamuralikrishna’s tillana in kalyANi, Tanjore S. Kalyanaraman’s composition in sindhubhairavi and Lalgudi G. Jayaraman’s swarajati composition in sindhubhairavi. She sang Lalgudi G. Jayaraman’s composition. * A common feeling about grahabhedam is that it is inaccessible to general listeners who may not have an intimate knowledge of swarams. But even without our realizing it, grahabhedam operates at a very fundamental level – our ear usually tends to hear the most familiar tune/stuff. She demonstrated this by saying that in her childhood, she was learning sudha dhanyasi and when her mom hummed mA ramaNan in hindOLam at that time, she actually got the picture of sudha dhanyAsi (tonic was not played by a drone and was not evident). She also gave the example of the dvi-madhyama pancama-varjya raga lalit that she sings in concerts which many people think is shubapantuvarALi, which is again an example of grahabhEdam at play. * In concerts, it is better to use familiar ragas for presenting through grahabhedam so that for the audience, additional effort doesn’t go into understanding the raga itself apart from the effort to understand the grahabhedam done. 1) Pallavi played by Veena Seshanna – “cakkani sAmikidi manci samayamura, nEDu” – rAgA tODi – misra jampa 2 kaLai. eDuppu 0.5 beat before samam. arudi 3.5 beats. 2) Pallavi played by Tirukodikaval Krishnaiyer. Taught to his father, well known vainika Doraiswamy Iyengar, by Mysore Vasudevachar – “elarA nAtO calamu, jEsEvurA srIkrishna” – rAgA kAmbOji – Adi 4 kaLai. eDuppu 3 beats after samam (3/4 iDam). arudi 7 beats. 8) Pallavi performed by Alathur Brothers – “kadir vaDivElA unadu pAdam tuNayE, OrArumuganE dEvadi dEvanE” – rAgA shanmukhapriyA – Adi sankIrNa gati. eDuppu 3 counts after samam. arudi 6 counts. 9) Pallavi performed by T.R. Subramaniam – “dasharatha tanayuni maravaka manasA, dinamu kSaNamu” – rAgA shankarAbharaNam – Adi 2 kaLai. eDuppu 0.5 beat before samam. arudi 4 beats. Has trikAlam in pallavi line itself.